There are two components to good decision making in markets: our ideas and our trades. Good things happen when these line up. When I refer to our ideas, I mean the bigger picture of the trade: the factors that lead us to believe that the market will make a particular directional move. For shorter time frame traders, those ideas may be based upon data releases or earnings events or other such events. For longer time frame traders, ideas may be grounded in fundamental factors, such as an acceleration of growth in the U.S. economy. Our ideas express what we believe will be moving the market. Sound ideas have some basis in reason--they make sense--and typically have some basis in backtesting. The second component of our decision making is our trading of the idea. This is how we implement the idea to achieve a favorable reward relative to risk. Our criteria for trading an idea are separate from the idea itself. For example, I may want to buy stocks on a surprise economic number that is bullish, but I might wait for the first pullback after the release to enter the trade. I want to see how sellers behave after the first pop higher in price to tell me if the catalyst truly is altering capital flows. If I see selling drying up at a price higher than when the news was reported, I'll enter the trade for at least another leg to the upside. The news catalyst framed my idea, but the dynamics of the price and volume action framed my execution of the trade. We see the same thing in sports. A coach will call a play on the basketball court. The focus then turns to executing that play well. A good play exploits the weaknesses of an opponent. But the good play doesn't lead to a score unless it is executed well, with good ball and player movement and players getting to the right spots on the court. You can't score if you don't run good plays, but good plays cannot lead to scores unless they are executed well. Above we can see a snippet from Friday's trading session in the ES futures. The screen grab captures four things I look at in executing a trade idea. The basic idea for my trading comes from an assessment of market cycle: specifically the relationships of event time spent in rising/falling in past cycles as those relate to the dynamics of a current, evolving cycle. (See the post on Cyclically Adaptive Trading for more background.) My basic idea was that a short-term cycle had peaked on Thursday and that we should see lower lows and lower highs over time on Friday. In executing the idea, the four elements I keep track of are time (and event time denominated in volume bars); price (red and green bars); volume (bottom of chart); and upticks/downticks among all NYSE stocks moment to moment (blue line). 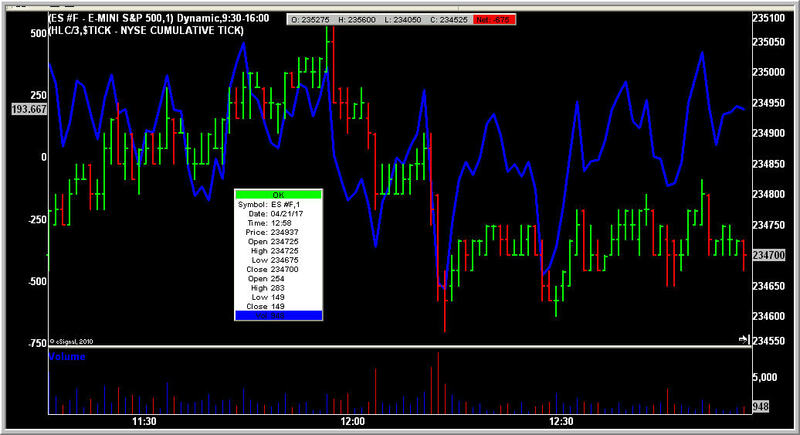 Note that we sold down around 12:15 PM with downticks greatly exceeding upticks and volume expanding on the decline. Sellers had taken control. When the buyers take their turn, we can see upticks handily outnumber downticks at several peaks between 12:30 and 13:00. Note, however, that volume dries up during those bounces and price can only retrace a fraction of the prior decline. The buyers just can't get it done. When I look at time, I'm looking for a rough correspondence between the amount of time spent declining and the amount of time spent in the subsequent bounce. (If we draw volume bars, the time equivalence is about equal in this example). Waiting for that time relationship to play out and selling on the final bounce in the NYSE TICK nicely executes the trade idea for a move down to 2341 a little after 13:00--a fresh low for the day on expanded volume. You may very well trade different ideas on different time frames and implement those trades in very different ways. The important point is that you trade well-researched, sound ideas and implement those in a way that aligns market flows with your bigger picture. It is not enough to have good ideas in markets; we have to be able to translate those ideas into good trades. Similarly, it is not enough to focus on chart patterns and short-term price relationships when larger market forces can run you over. The greatness of a painter is that he or she sees a big picture--an inspiring vision--and then executes that brushstroke by brushstroke. It takes a similar combination of vision and execution to make for great trading.